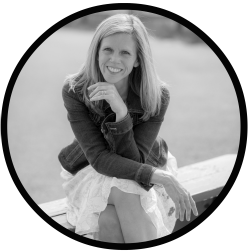 I'm joining my friend Kristin Taylor in a 10-week study of Donald Miller's book Storyline: Finding Your Subplot In God's Story. I've only read the first few pages of the book but he won me over by the third paragraph with, "We believe your story was a blank page given to you by God and to write a great story on that page is a noble pursuit and a gift to the world." Coincidentally, my most recent post for Circles of Faith encourages others to tell their story because when we do God is glorified. God reveals His love story for us through our stories. In the introduction of Storyline Donald Miller writes, "...but what mattered, more than anything, was that I had been used by God for some small purpose." He suggests that we play a role in God's story. We have a subplot in His story — His epic story. The truth of the matter is our story isn't about us; it's about Him. What part does God want us to play in His story? Okay, I have not read past the introduction so I won't get too far ahead of myself here. My mind has been bouncing back and forth between what my subplot in God's story may be and my God-sized dreams. I see a connection between the two. Sometimes I think I have way too much time on my hands for thinking. I do my best to keep looking up so my thinking doesn't head south on me. Over the weekend the BraveGirl Community shared a video by Tedx of Glennon Doyle Melton sharing her Lessons from the Mental Hospital. In the seventeen minutes of the video Glennon, with great vulnerability I might add, tells her story. There were times in those seventeen minutes when I felt like she was telling my story. Bulimic. Mental Hospital. Capes. Pretend. Numb. Lie. These words all hit close to home — they are familiar. Shortly after watching the video I came across a status update by the BraveGirl Community saying, "We want your brave story." Glennon's powerful testimony has me encouraged to tell my own story. I want to "make the unknown known." As I consider telling my story my thoughts return to my God-sized dreams. I'm one who would have previously told you I don't have a God-sized dream. But lately God has had a thing or two to say about that. I recently shared a dream to write an e-book. The book would follow my hopes of joining The Nester this October in writing for 31 days on finding JOY in a deployment. Another dream is to encourage military wives. I'm currently living out this dream for the next eight weeks by co-leading an (in)courage group for military wives. Prior to these dreams, God placed a dream on my heart to tell my story. That dream led me to begin blogging. I've told bits and pieces of my story over the years. Some parts are easier to tell, some are harder and others I'm unable to tell. The dream goes beyond telling my story here. Maybe I will never be brave enough to tell my story like Glennon did. But God planted a dream way down deep in my heart to stand before others and pour out my heart. "I want to feel my feelings and share." I'm reminded of something Deidra Riggs said at the Compel Conference: "We are here to reflect God glory here on earth." How do we reflect God's glory? We share our stories. I know my story, my subplot in God's story, is continually unfolding. However, I believe God wants me to tell the beginning chapters of my story. Those chapters reveal what only God has the power to do. Hi there Beth, my mind has been bouncing around how to tell my story through HIM a lot lately. Thank you for your weekly encouragement! You would probably enjoy the book, Debbie. It really encourages you in this process. Thanks so much for sharing with us. Yes, I believe our stories are important, and I'm looking forward to hearing more about yours. Hope you continue to enjoy and be inspired by the book you are reading. Thank you for your encouragement, Anita. I can't wait to hear more about how God has worked through you to tell His story! I, for one, know how it can be scary to do...at first. 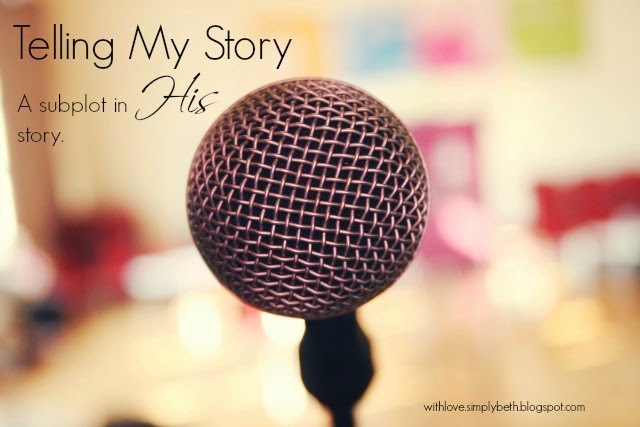 I started blogging because was so excited to share all that God had been teaching me. But for the first couple of years, I kept my story of redemption quiet. I was afraid of judgement from people. But, with the encouragement of my husband and of a friend who interviewed me for a series that went along with her book (yikes!) I shared. When I did, I felt that what God wanted to tell was out there for whomever needed to hear it. And in the process, He was glorified! I know He'll be glorified with your story, too, Beth!! Praying for courage and strength as you gather the words to share! God's doing something mighty and beautiful through you, friend! Thank you for all your encouragement, Kristin. I'm looking forward to the next 10-weeks of this study. I look forward to following you and your story! Hello Veronica. I'm always so delighted when to see a new face here. Thank you for stopping in and for sharing. I am, at this very moment, so proud of you. Telling one's story is more than stringing words together, it's the baring of one's inner self. Our hearts, our mistakes, our dreams...and many of those things most folks are afraid to even whisper about. But here you are, sharing yours and allowing God to shine through every syllable. So here I am, teary-eyed and smiling. You are so awesome and God is so good. Your comment brought tears to my eyes today, Anna. Thank you so much. God is SO good and I'm so grateful for the opportunity He has given us to get to know each other better. Oh my gosh!! Can I tell you how SO very proud I am of you?!! Seriously girl, God is speaking through you. Our stories are what make us who we are. Is it scary? Heck, Yeah! Looking forward to reading more of your story. Glennon is one of my favorite writers ever! She is transparent, authentic, and HONEST! When we are these things we are breaking down walls and overcoming the dark. Love you, friend!!! I love hearing everyone's stories! God uses our tests to make testimonies - that is for sure! And I am so proud of the way you have pressed through your husband's deployment! I have said more than once I cannot imagine what that would be like. You and all of the military spouses/children are heroes! Thank you so much, Beth. The blessing of technology sure makes this deployment thing much easier. There are hard days but each day is one day closer. I truly appreciate your kind words. Beth, it's wonderful to see how God goes about waking up dreams inside of us and then leading us along paths that lead to fulfillment of those God-size dreams. We never know just how much others may be encouraged or strengthened by our stories. Wanda, I keep telling myself if my story impacts only one person than it was still worth sharing. Thanks for your encouragement. I love Donald Miller's writings; I must get Storyline soon and work through it as well. And I love Glennon Doyle's writings as well. I'm off now to listen to her TED talk... Thanks for sharing these great resources. And I pray you'll continue sharing more of your own story. Everybody's story matters. This is the first book I'm reading of his and I just downloaded Glennon's book. I hope you enjoyed her TED talk. "How do we reflect God's glory? We share our stories." This is so true. I was just having a conversation yesterday with a couple of bloggers about the vulnerability we have as writers when we share parts of our story, but also how it can powerfully speak to someone else when we are honest about ourselves and what we've been through. Thanks for the encouragement to continue to share our own stories! Thank you for what you share. Your story encouraged and I see God impression on it in so many ways. OH, yes, Beth. I want to hear your story. And you give such encouragement for all of us to find our voice. You are such an inspiration and encouragement to me dear Beth! I am so bless to know you and can't wait to hear more of your story!!!! Blessings and love my dear friend!!! "The truth of the matter is our story isn't about us; it's about Him." And He's writing it on the pages of our hearts... God bless you, dear Beth, as you share the story He's writing on yours. So glad to be your neighbor at Thought-Provoking Thursday. My heart smiled when I saw your face! 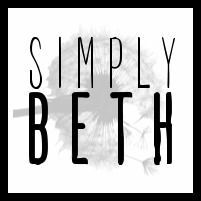 Beth, this is so cool! I'm doing Don Miller's Storyline too! Actually I've been at it for almost a year, but it's worth it to go slowly and process it all. Telling our stories is powerful. I've been silent for so long that even writing down some of the low points has been a challenge. But God... hallelujah!